“A Tooth For An Eye” is the first single lifted from the forthcoming album ‘Shaking The Habitual’ by Swedish electronic duo The Knife – their first since 2006’s brilliant ‘Silent Shout’. Texturally and sonically “A Tooth For An Eye” varies quite significantly to the last time we heard from Karin Dreijer Andersson and Olof Dreijer. The single is a heavily percussive number, which actually emanates an organic quality thanks to its angklung rhythms, which so strongly characterise the song. Combined with its Bjork stylings, vocally and musically, “A Tooth For An Eye” is undeniably and unmistakably Scandinavian. It’s a complex little number both in terms of arrangement and instrumentation and initially it appears to be a lot less hook-y than previous material. Upon multiple spins, the musical and vocal hooks emerge in a most unusual way. Devoid of the electro-clash as heard on tracks like “Neverland” or the rich, synth driven sound of “Marble House“, “A Tooth For An Eye” shares more in common with say, “From Off To On“. The press release states the song deconstructs images of maleness, power and leadership. Who are the people we trust as our leaders and why? What do we have to learn from those we consider inferior? In a sport setting where one would traditionally consider a group of men as powerful and in charge, an unexpected leader emerges. A child enters and allows the men to let go of their hierarchies, machismo and fear of intimacy, as they follow her into a dance. Their lack of expertise and vulnerability shines through as they perform the choreography. Amateurs and skilled dancers alike express joy and a sense of freedom; There is no prestige in their performance. The child is powerful, tough and sweet all at once, roaring “I’m telling you stories, trust me”. There is no shame in her girliness, rather she possesses knowledge that the men lost a long time ago. 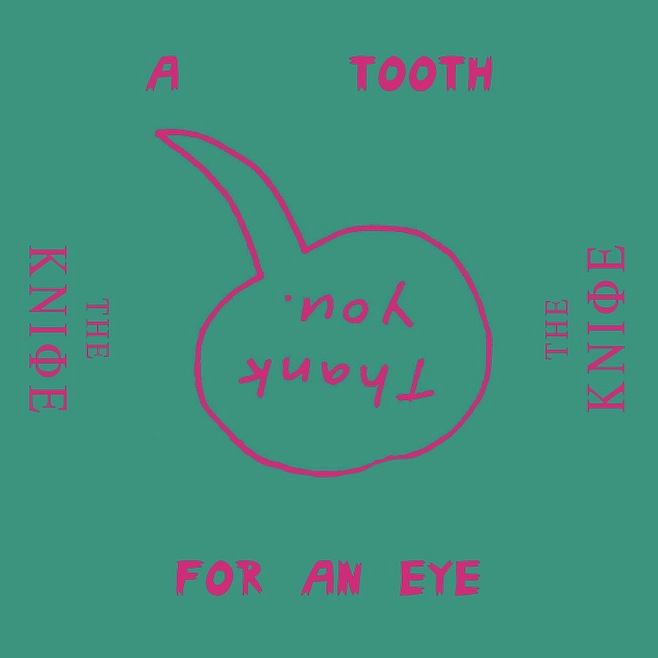 “A Tooth For An Eye” is a definite grower and whets the appetite for The Knife’s forthcoming album ‘Shaking The Habitual’, which will be released on 8 April, 2013. Pre-order the album via The Knife website.